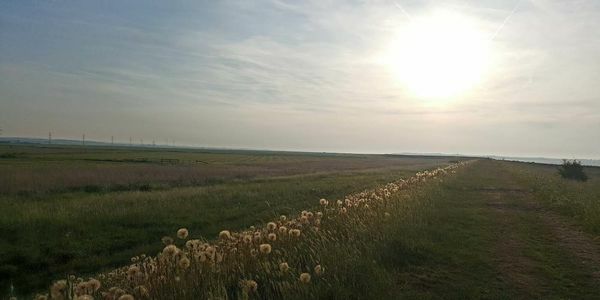 petition: Save Graveney Marshes habitat and wildlife from obliteration by 1 MILLION solar panels! Cleve Hill Solar Park are proposing a solar farm consisting of 1 million solar panels on 900 acres of Graveney Marshes, near Faversham in Kent. If approved, this will be the largest solar park in Europe. Please sign our petition to stop this development. Graveney Marshes border a unique and unspoilt stretch of the Thames Estuary which provides a wonderful natural and far-reaching landscape full of wildlife for both local residents and visitors. It is an important place for migratory birds and home to a number of Schedule 1 species under the 1981 Wildlife & Countryside Act including Marsh Harrier, Peregrine Falcon, Merlin, Avocet, Kingfisher and Redwing. Barn Owl, Red Kite and White-tailed Eagles have also been spotted here and it is an important area for other species including great crested newts and water voles. Additionally, it is steeped in history as it played host to the last gun battle of WWII! Graveney Marshes is enclosed on 3 out of 4 sides by a number of designated areas including Ramsar (wetland site), Site of Special Scientific Interest (SSSI), Special Protection Area (SPA). It also a Biodiversity Opportunity Area, a Higher Level Stewardship Target Area, an Environmentally Sensitive Area and a Nature Improvement Area. The marshes are also surrounded by areas of conservation including Swale National Nature Reserve, Elmley National Nature Reserve, Oare Local Nature Reserve, South Swale Local Nature Reserve and Seasalter Levels Local Nature Reserve. We all agree that generating energy from solar or other 'clean' renewable methods is preferable to using fossil fuels such as coal, oil, or gas. However, this shouldn't be to the detriment of the environment and its wildlife. • It's in the wrong place. A decommissioned coal power station like Kingsnorth in Kent would be better. Due to the size of this proposed development the decision is made by the Secretary of State, so local planning committees, who know the area and understand the impacts, are bypassed. A working party has been set up by local residents to oppose this development and we really need your support. Find more details at www.savegraveneymarshes.org. Please sign our petition and ask the Secretary of State to decline this application to preserve Graveney Marshes. Thank you for signing my petition. I urgently need your help again please as the plans have been accepted for examination. Please register your objection at https://infrastructure.planninginspectorate.gov.uk/projects/south-east/cleve-hill-solar-park/?ipcsection=relreps BY 23:59 ON 28 JANUARY. Further details can be found at https://savegraveneymarshes.org/how-to-register/. Please encourage family and friends to register too.